As a teen, Clint Eastwood acted in a school play, but was struck with such stage fright he vowed never to act again. He eventually changed his mind. After graduation, he worked odd jobs before going into the Army, where he became buddies with two other soldiers who had an interest in acting, David Janssen and Martin Milner. After they were discharged, the three of them shared an apartment in Los Angeles. Janssen went on to become TV's The Fugitive, while Milner became a beat cop on Adam-12. Eastwood, of course, became one of the movies' all-time toughest tough guys, and an Oscar-winning director. Signed to a contract at Universal, Eastwood got tiny roles in Revenge of the Creature with John Agar and Francis in the Navy with the famous talking mule. Then things got worse, as he was assigned roles in such long-forgotten films as The First Traveling Saleslady with Ginger Rogers and Carol Channing, and Lafayette Escadrille with Tab Hunter. Finally, Universal dropped Eastwood, telling him that his Adam's apple was so large it distracted from his face and made him funny-looking. Out of work, Eastwood auditioned all over Hollywood, but he was usually rejected, and soon returned to odd jobs for a few months. His lucky moment came when he went to the CBS studio to pick up a friend, and Eastwood was spotted by an executive who thought he had the right rough-and-tumble look for an upcoming western. For the next seven years Eastwood was Rowdy Yates on Rawhide, which spawned the catch phrase "Head 'em up, move 'em out". The show made him a TV star, but the character bored Eastwood silly. He yearned to act in movies, but Hollywood filmmakers had little interest in a familiar face from TV. 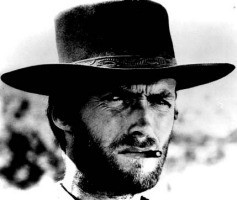 So Eastwood accepted an offer from Italian movie maverick Sergio Leone, and began making low-budget westerns in Italy. Eastwood's all-eyes acting was a perfect match with Leone's sparse but riveting dialogue, easy-to-translate plots, rich widescreen visuals, and rousing music by Ennio Morricone. His trio of films for Leone, A Fistful of Dollars (based on Akira Kurosawa's Yojimbo), For a Few Dollars More with Lee Van Cleef, and The Good, The Bad, and The Ugly with Van Cleef and Eli Wallach, were dismissed by snooty American critics as "spaghetti westerns", but these popcorn-muncher flicks made Eastwood one of the biggest movie stars in the world. Returning to America, Eastwood starred in Where Eagles Dare with Richard Burton. Then he decided that "I can screw up my career just as much as anybody else", and started his own movie production company. He named it The Malpaso Company, after a creek that runs through some property he had purchased in Carmel, California. His company's first production was Hang 'Em High in 1968. Over subsequent decades, Malpaso has produced most of Eastwood's famous films, including Dirty Harry, The Enforcer with Tyne Daly, Escape from Alcatraz with Patrick McGoohan, Firefox, High Plains Drifter, Magnum Force, Midnight in the Garden of Good and Evil with John Cusack and Kevin Spacey, The Outlaw Josey Wales with Sondra Locke, Paint Your Wagon with Lee Marvin, Pale Rider with Michael Moriarty, A Perfect World with Kevin Costner, Play Misty for Me, Two Mules for Sister Sara with Shirley MacLaine, and Every Which Way But Loose and Any Which Way You Can with Clyde the orangutan. He wanted to work with John Wayne in a western, but the feeling wasn't mutual. "I gave him a piece of material that I thought had potential for us to do as a younger guy and an older guy. He wrote me back critical of it. He had seen High Plains Drifter, and he didn't think that represented Americana like She Wore a Yellow Ribbon and other John Ford westerns. I never answered him". Eastwood made several movies with director Don Siegel, who made the original Invasion of the Body Snatchers, the 1964 Ronald Reagan remake of Ernest Hemingway's The Killers, and Wayne's last film, The Shootist. Siegel-Eastwood collaborations include the classics Dirty Harry and Escape from Alcatraz. On Eastwood's first film as director, Play Misty for Me, Siegel was his mentor, often on the set, looking over his shoulder and offering advice. After Leone's death in 1989 and Siegel's in 1991, Eastwood dedicated 1992's Unforgiven to "Sergio and Don". The film, starring Eastwood with Morgan Freeman, Gene Hackman, and Richard Harris, won four Oscars. Eastwood won two, for Best Director and Best Picture. Eastwood has directed 25 feature films, most starring himself, and most earning good-to-excellent reviews, including The Outlaw Josey Wales, Bird (the biography of Charlie Parker starring Forest Whitaker), The Bridges of Madison County with Meryl Streep, Mystic River with Kevin Bacon, Sean Penn, and Tim Robbins, and Million Dollar Baby with Hilary Swank and Freeman again. Eastwood's no-nonsense libertarian streak became newsworthy in 1986 when, bogged down by red tape when he wanted to expand his restaurant (Hog's Breath Inn) in Carmel, California, he announced that he was running for mayor. He won with a 72% landslide, and his two years as Mayor reduced the city's regulations, had sidewalks put in on city streets, and got a library annex built that city elders had been bickering about for decades. And then, in a move more politicians should emulate, he declined to run for a second term. The Hog's Breath closed in 1999, but Eastwood still owns his movie company, a golf course, Tehama Clint sportswear, and Pale Rider Ale. Eastwood sponsors the Clint Eastwood Youth Program, providing drug, alcohol, and mental health treatment for kids in and around Carmel. In 1993, he sued the National Enquirer over an alleged "exclusive interview" the tabloid published, and won $150,000 in damages and $650,000 in attorneys' fees. In 2002, he sued Patrick McGilligan and St. Martins Press, author and publisher of an unauthorized Eastwood biography, for claiming that he had beaten his first wife. The suit was settled when the author and publisher issued a retraction, and promised to excise that claim and make several other changes in any subsequent editions of the book.